To check the flow processes in pipeline systems and for insight into the interior of process pipes, many flow indicators are used in which the flowing medium sets a rotor turning and thus, to a large extent, visibly signals a flow. 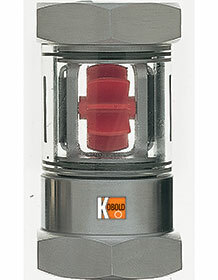 The special feature of Kobold’s special version, Type DAA, is that the rotor is housed in a glass cylinder. This version ensures a functional flow check from two points of view. On one hand, its construction as a visible cylinder gives a relatively large and thus easily observed field of observation. In addition, the rotary movement of the Teflon rotor permits reliable monitoring of cloudy or dark media due to its noticeably bright colour. This type of device is already widely used and has proved itself in industrial use thanks to its functional reliability. The design and construction of the DAA flow indicator deserves special mention. Due to integration of two wiper elements, Kobold has, for the first time, been successful in combining a flow indicator with a device which allows the equipment to be cleaned during operation. The sight tube can be rotated so that the wiper elements concentrate the dirt into two narrow strips on the interior of the glass. From there it is taken away effortlessly by the flow. For this purpose, the Borosilicate glass tube is fitted with O-rings which slide easily, so that the cleaning of the unit can be carried out by hand even under full operating pressure. The flow indicator with integral cleaning device can be used in any position for checking the flow of gases and liquids. A choice of sizes is offered with connection dimensions G¼ to G1½, with which flow rates of 0,4 l/min up to 100 l/min can be reliably checked. Along with the standard housing version in brass, the units are also offered in a resistant stainless-steel version for aggressive media. If the rotor is unwanted for particular applications, e.g. for increases in flow rate, the unit is also available with just a sight glass with cleaning device. The type DAA flow indicators are usable for operating pressures up to PN 16 at temperatures up to 100°C.